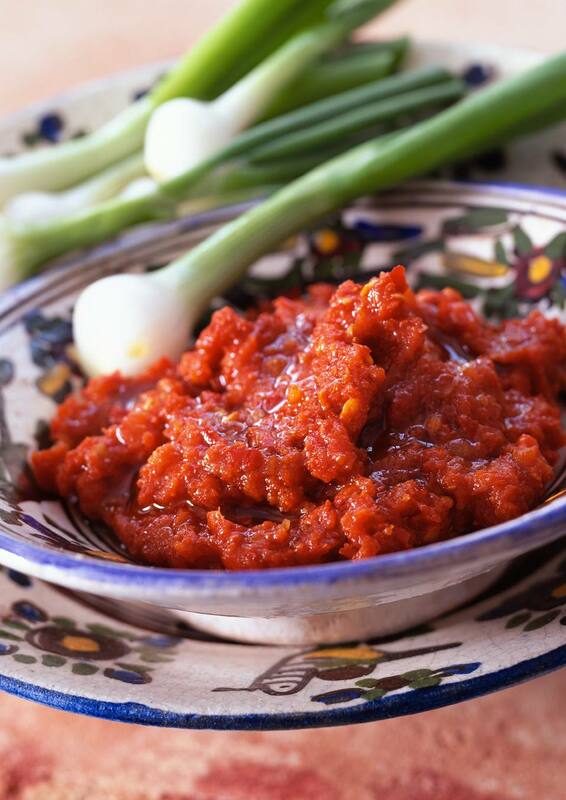 Tunisian in origin, harissa is a delicious red chili pepper condiment now accepted as part of Moroccan cuisine. Dried red chili peppers are ground to a paste with garlic, spices, lemon juice and olive oil. Some Moroccan recipes also include tomato paste or puree or roasted red peppers, but I prefer this version. You can use a small processor, blender or immersion blender to make harissa, but this quantity is easily made in a large mehraz, or mortar and pestle. Any single variety or mix of dried chili peppers will work, so select your peppers according to desired heat. If you find your harissa is hotter than you expected, try mixing in some pureed roasted red peppers or tomato paste to reduce the pungency. Harissa is sometimes added with other ingredients during cooking, but most often it's offered on the side as a condiment. When enjoying it with tagines, for example, we place a small spoonful on the side of the dish and dab our bread in the chili paste before moving on to the meat, sauce, and veggies. Remove the stems and seeds from the dried chili peppers and place them in a bowl. Bring four cups of water to a boil and pour it over the chili peppers; leave the peppers to soften for 30 minutes to an hour. While the peppers are soaking, heat a skillet over medium heat until hot. Add the whole spices and toast until fragrant, stirring constantly, for about a minute. Remove the pan from the heat and grind the spices with a mortar and pestle or spice grinder. Set aside. Drain the chili peppers and gently squeeze out excess water with a paper towel. Using a mortar and pestle (or a blender or mini food processor) grind the chili peppers, garlic, salt and spices to a paste. Add the lemon juice and just enough olive oil to moisten the harissa to desired consistency. Taste and adjust seasoning. Store unused harissa in an airtight glass container in the fridge. For long storage, lightly top the harissa with a little oil before closing.